Sen. John McCain, R-Ariz., in June 2017, just over a year before he died. President Trump has attacked the Senator's legacy multiple times this week. President Trump has once again decided to attack his old political nemesis, John McCain, raising him from the dead like a perversion of the Lazarus story during this Lenten season. I have something to say about that. But first, a caveat. This column is not for the people who hate this president. “Hate” is not hyperbole here, because many of them have used the word (and worse), so it’s fairly clear he’s their enemy. Nor is this column for the people who adore our president. “Adore” is not hyperbole, either, because many have bonded together in tribal allegiance and refuse to acknowledge that Trump has been ignorant, arrogant, and sometimes cruel. This column is for a group of people who may no longer exist, or sometimes feel like they never existed except in my mind. It’s for those who haven’t allowed their fundamental decency to be corrupted by a desire to “get back” at the other side, and who are able to measure right and wrong independent of their political views. Trump has taken aim at McCain, who died seven months ago, multiple times over the last week. The Trump vs. McCain feud began before Trump even arrived in D.C. When then-candidate Trump lobbed insults at Sen. McCain in 2016, saying he preferred heroes who didn’t get captured, I wasn’t alone in feeling disgust. Trump and McCain continued to trade barbs throughout the campaign. But it’s over the past year that things got really ugly and personal. 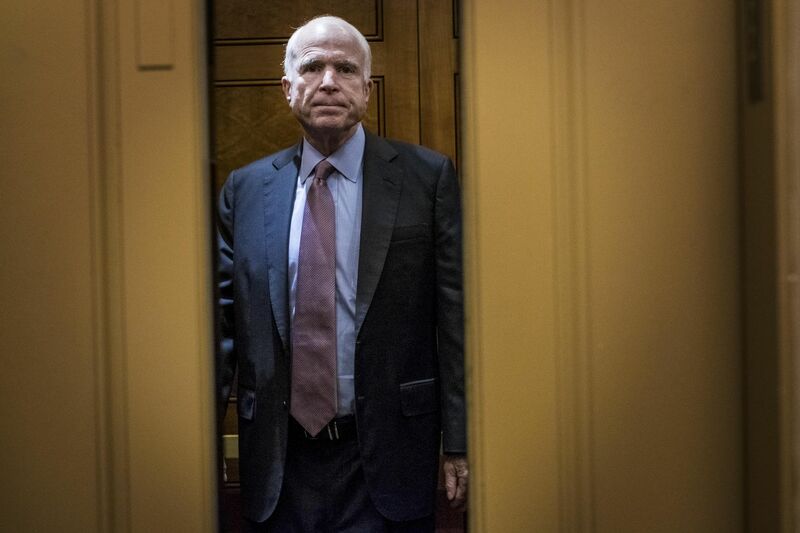 In 2018, when Trump nominated Gina Haspel to replace Mike Pompeo as head of the CIA, McCain was unequivocal in his opposition, citing her involvement in the agency’s alleged “torture” practices under President Bush. Not only that, the former resident of the Hanoi Hilton lobbied other senators to oppose her nomination. It’s not surprising that a man who was himself tortured by the North Vietnamese for more than five years would push back against a woman who helped implement the controversial post-9/11 policies. The White House reacted. Kelly Sadler, a special assistant to the president, reportedly quipped that it didn’t matter how the senator, who had been diagnosed with inoperable brain cancer, voted because “he’s dying anyway." That same week, retired Air Force Gen. Tom McInerney implied on Fox News that McCain had been an informant while in captivity, calling him “Songbird John.” It’s true that Trump didn’t make either of these comments. But he never condemned them, either. And then, McCain, who knew the end was approaching, made it clear that he didn’t want Trump at his funeral. I understood his desire to exclude the man who showed such disrespect and hostility toward him, even as I later criticized his daughter for her eulogy, which was a veiled attack on that same man’s character. Still, I hoped that death had put an end to the hostilities. Useless to explain that this president didn’t “give” McCain anything to which he wasn’t already entitled. And it is foolish to expect Donald Trump to curb the raging furies in his mind and speak with humility and humanity. He’s just not that kind of man. The people who love and make excuses for him call this “plain talk,” and love the fact that he speaks crudely and with the self-control of a kindergartner. But as I said, this column isn’t for them. It’s also not for the people who’d hate Trump even if he spoke with the eloquence of Winston Churchill. They’re lost causes, co-opted by passion. This is for the people who cringe when facts are made irrelevant, and when basic decency is thrown out the window. I know you’re out there. Speak out and condemn this travesty of defaming a hero, once and for all.